A friend of mine noticed this perspective but I managed to take the shot. :-) Actually it took a little digital help in order to capture more detail. This was part of an intriguing multi-lingual Scrabble game on 21 August 2005. Anyone whose native language was not English was allowed to use the dictionary: we had Japanese, Italian, and German. 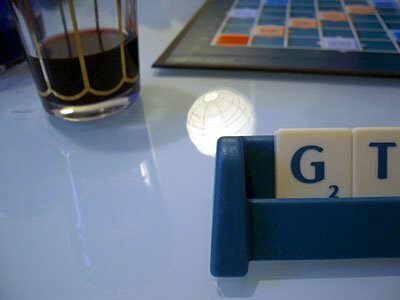 I sure hope these were my tiles -- otherwise I was cheating! 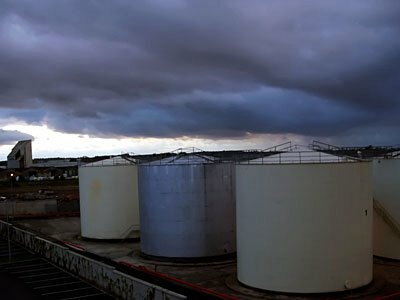 The view on 13 August 2005 from (a different) friend's room out over some lovely oil storage drums. These are still active and should they ever blow, they will take a large community of student dwellings with them. It's a little unsettling. The building in the background to the left has the most intriguing geometry; I was compelled to sketch it and I'm not much of a visual artist.